Real-time control of a 360km water distribution system through an advanced distributed control system. In many countries, the lack of a stable water supply is constraining living standards and industrial development. Botswana is the world’s largest producer of diamonds (by value) and a major exporter of other natural resources. In the east of the country new mining ventures, power sector developments and a growing population are driving up the demand for water. To manage demand across their extensive network, our customer needed an advanced configuration of both a local and remote pump station and reservoir monitoring with minimum commissioning time. 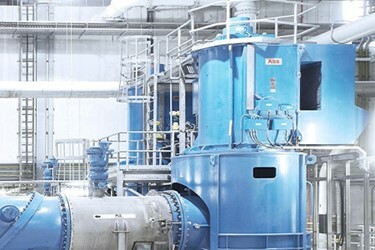 ABB Ability™ solutions for pumping stations and reservoirs include the ABB Ability™ distributed control system to monitor and control the facilities located along the 360km water network. The DCS architecture enables aggregation of data across distributed geographies and is ideal for applications such as the Botswana water network.